Travel bloggers get asked a lot how in the world they find their travel budget. I get asked a lot. I´ve even heard people say they were jealous. Today I´d like to spend a moment on the truth about how I find the money to travel. Because it isn´t magic. It isn´t illegal. I don´t earn more than many of you probably do, I just spend it differently. 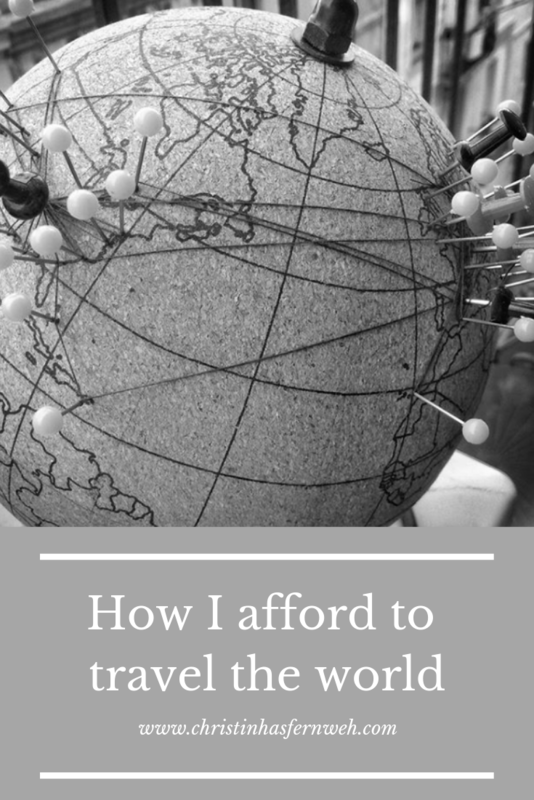 So you think you can´t afford to travel? Well, I don´t have the money to smoke. I don´t have the money to buy new clothes every season. I don´t have the money to go out partying every weekend. I don´t have the money for a lot of things (that granted, don´t matter very much to me). Because those things cut away from my travel budget. I know people who BUY cups of coffee every day but complain they can´t afford to travel. It´s a matter of priorities. Travel is important to me so that is what I spend my money on. Addictions cost a lot of money, and it´s so easy to do the math. How much do you spend on cigarettes? Coffee? Your unlimited phone plan? Netflix? That my dears, is my travel budget. Because travel is my addiction. Yeah, so obviously, don´t be stupid 🙂 Don´t spend all you make. You need an emergency fund. You will need savings. Also, make sure you have an income! If you are worried about money, you are not the type to quit your job and buy a one-way ticket. Either find a way to travel in your time off or find a job that allows you to travel while working. Make sure you can access your savings from anywhere in the world. There are plenty of credit card companies that offer travel cards. Don´t be broke abroad. If you´re on a budget, do your research and find a destination that matches your budget. When you find your destination and know how long you want to stay there, find out how much that will cost. How much is food there? Transportation? Attractions you want to see? Plan where you want to go and how you´ll get there, so you don´t end up having to take expensive taxis. Once you know how much it will cost, you know how much you have to save before you can take off on your dream trip. Don´t get into debt. Pay your bills, and from what is left as disposable income, make travel decisions. A person who makes $1000 but only has $500 worth of bills will be able to accumulate a travel budget sooner than a person who makes $5000 but commits $4800 in monthly expenses. It´s not about how much money you make. It´s about how much cash you leave disposable for yourself. That´s why moving to an area with higher wages doesn´t work. Because life is more expensive in those areas and in the end you gain nothing. If there was a city with super high income and super low cost of living – why doesn´t everybody live there yet? You know how I am able to travel to up to 10 countries a year? Because I don´t spend much when I am there. Yes, it takes discipline. And preparation. I research free things to do. I take food or buy it in grocery stores instead of going to restaurants 3 times a day. Food can easily become an expensive part of any trip. Alcoholic drinks even more so. And coffee, whether it´s fancy cafés or Starbucks. For what other people spend on coffee in a month, I can take a weekend trip to a place I haven´t been to before. I am also a minimalist. I don´t buy stuff I don´t need. So before you spend money on something, pause for a moment and just think. Is this necessary? And when you do spend money on something, enjoy it! Make sure you are in the moment and take full advantage of what you have bought. This ties in with the question of what to do with your stuff. I addressed this is my post on ¨how to fit your life into one suitcase¨. Since all the above tips feel come from things I am very used to doing, I am very interested if you learned anything from reading this post. Please do let me know in the comments below!